I make beans with an accent. I understand all of the elements, but they don’t always flow together as easily as I would like. A staple of Latin American cooking, I should know them better than I do. Having only developed a taste for them as an adult, I refused all forms of frijoles, lentejas, or garbanzos when I was younger. Now that I appreciate what I’ve been missing and want to make them all the time, I feel like I’m being punished for my earlier brattiness with inconsistent batches of beans. If only I’d paid better attention when my grandparents were cooking, I’d have a freezer full of stews and soups to get me through the winter. With a blizzard on the way, I knew I’d be home bound so I thought it would be the perfect day to make a big, slow-cooking pot of garbanzos. Despite the declared snow day, I sent myself to chick-pea school and looked through every garbanzo recipe I had. By comparing, I was able to pick up tips and see where I’d gone wrong before. I knew I wanted chorizo but not hamhock, pimentón but not saffron, and something heartier than soup but lighter than stew. Worried less about the perfect result and more about just figuring it out, it was a good batch day. Revised as of August 22, 2009. 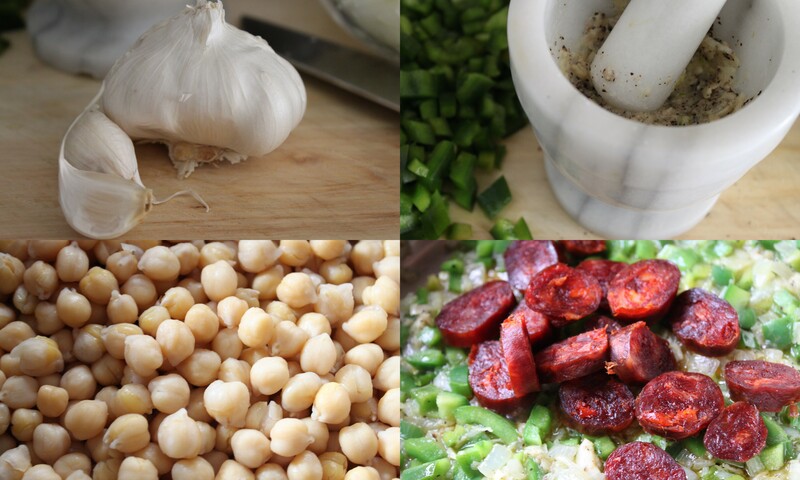 Soak chickpeas in water with a pinch of baking soda overnight, about 10-12 hours. Drain and rinse well. In a large heavy pot, pour 6 cups of hot water over chickpeas. Bring to a boil then lower heat to medium-low, cover, and simmer until just tender, about 30 minutes. Drain and reserve 2-3 cups of the cooking water. Using a mortar and pestle or garlic press, mash the garlic cloves with salt and pepper to form a smooth paste. Set aside. To make the sofrito, heat the oil in a large skillet over medium heat. Add the onions and peppers and sauté about 5 minutes until soft. Add the mashed garlic and sauté an additional 2 minutes. Add the chorizo and cubed ham and sauté until lightly browned, 2-3 minutes. Add the tomato sauce, wine and bay leaf to the sofrito and simmer an additional 5 minutes. Return chickpeas to the large pot with 2 cups of the reserved cooking water, add more if needed. Add the potatoes and sofrito mixture to the chickpeas. Bring to a simmer and cook, covered, until the potatoes are tender, about 20-25 minutes. Once the vegetables are cooked through, the desired consistency is a matter of taste. It can be served immediately as soup or allowed to cook a little longer, uncovered, for a thicker stew, about 15 minutes. Serve on its own with bread or over rice. 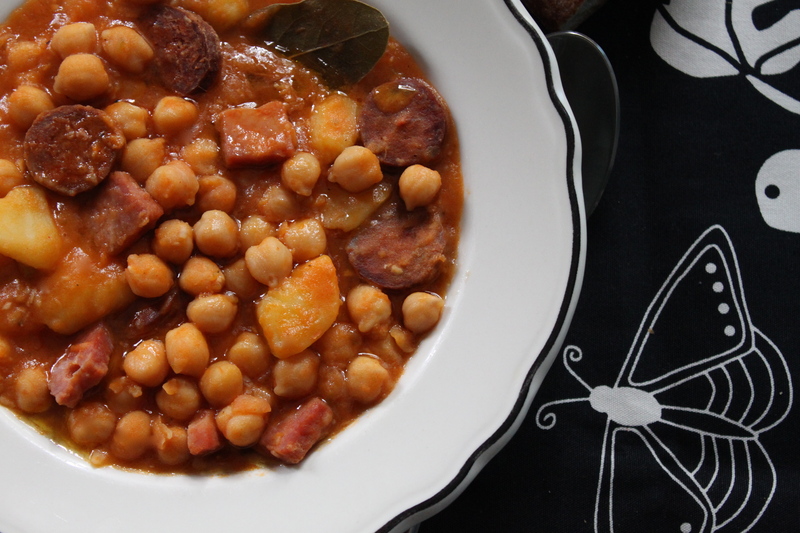 Notes: This stew freezes extremely well for up to a couple of months. Once cooled, portions can be well sealed in freezer bags, defrosted and reheated with a little added water or broth as needed. mmmmm that looks delicious. perfect for a cold winter day. ANA I HAD A FABADA ON SATURDAY THAT LOOKED A LOT LIKE THAT. I COULD EAT THAT RIGHT NOW. IT IS COLD IN MIAMI 40 DEGREES SO IT WILL COME HANDY. This was so good! I didn’t see where to add the Paprika though, so I put it in with the garlic mash! My grandma used to make this and take left overs and press and fry the potaje in a pan and it was so tasty. Do you know how to make that with the left overs? I ask because I am desperatey trying to figure out how to do that. Hi Alexandra, I think it’s fine to just do what you’re grandmother did and let them cook down a little more. Thanks! Alexandra, Google Receta de Garbanzos Fritos a la cubana. 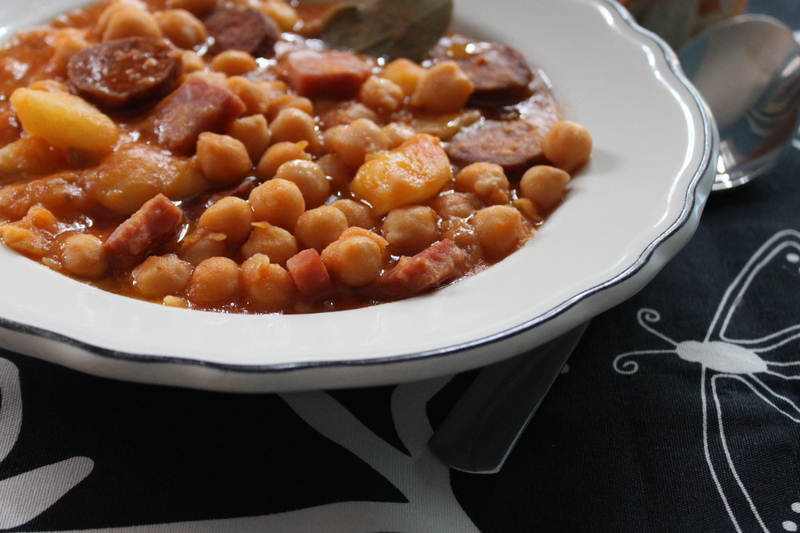 My aunt used to make them with leftover potaje de garbanzos. Mashed and fried it’s to die for and of course bring back many great memories. Thanks so much! I have been dying to have those! Yum!